The BlueClaws' rally from 5-0 down fell two runs short on Friday and they lost to Delmarva 5-3. 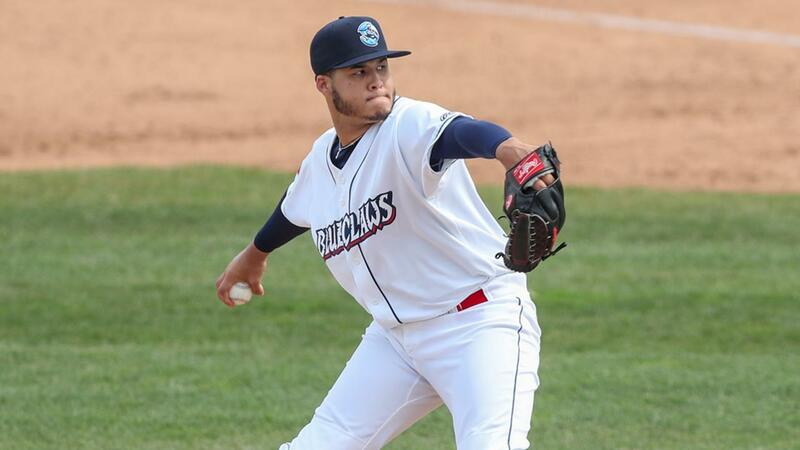 SALISBURY, MD - Grayson Rodriguez struck out 10 BlueClaws over six scoreless innings as Delmarva topped the BlueClaws 5-3 on Friday night at Perdue Stadium. Delmarva (6-1) has taken the first two in the series from the BlueClaws (3-6), who have dropped three straight games after a three game winning streak. Lakewood trailed 5-0 in this game, but brought the tying run to the plate in the eighth and ninth innings before falling short. Rodriguez, the 11th pick in last year's draft, has fanned 20 hitters in 11 innings over his first two Sally League starts, improving to 2-0 on the year. He walked three and allowed just a lead-off single to Malvin Matos in the fourth inning. Delmarva scored twice in the first inning to take a 2-0 lead. Daniel Fajardo's two-run single brought home Robert Neustrom and Adam Hall. The Shorebirds added a run in the third. Andrew Fregia reached on an error with two outs and scored on Neustrom's RBI single. Lakewood starter Victor Santos came out after five, allowing three runs (two earned) with seven strikeouts and no walks. The 18-year old has struck out nine without a walk in his first two appearances with the BlueClaws, but took the loss to fall to 1-1 on the season. Francisco Morales came on in the sixth and gave up two runs in the seventh on a double by Adam Hall. That put Delmarva up 5-0. Lakewood added two runs off Jalen Miller in the eighth, getting one on a wild pitch and another on an RBI single from Malvin Matos. Jhon Peluffo came on in the ninth and gave up an RBI single to Jonathan Guzman to cut the lead to 5-3. However, Luis Garcia was thrown out trying to bunt for a base-hit to end the game, giving Peluffo his second save. Matos had two hits for Lakewood while Cadyn Grenier, Neustrom, and Hall all had three hits for Delmarva. The teames continue their series on Saturday night at 7:05 pm. RHP Kevin Gowdy (0-0) starts for Lakewood opposite LHP Drew Rom (0-0).